Sarah Catharine Paulson (born December 17, 1974) is an American actress, director, and producer. She has received numerous accolades, including a Primetime Emmy Award and a Golden Globe Award. In 2017, Time named her one of the 100 most influential people in the world. A native of Tampa, Florida, Paulson was raised there and later in New York City following her parents' divorce. She began her acting career after high school in New York stage productions before starring in the short-lived television series American Gothic (1995–1996) and Jack & Jill (1999–2001). She later appeared in comedy films such as What Women Want (2000) and Down with Love (2003), and drama films such as Path to War (2002) and The Notorious Bettie Page (2005). From 2006 to 2007, she starred as Harriet Hayes in the NBC comedy-drama series Studio 60 on the Sunset Strip, for which she received her first Golden Globe Award nomination. In 2008, Paulson starred as Ellen Dolan in the superhero noir film The Spirit. Sarah Catharine Paulson (born December 17, 1974) is an American actress, director, and producer. She has received numerous accolades, including a Primetime Emmy Award and a Golden Globe Award. In 2017, Time named her one of the 100 most influential people in the world. A native of Tampa, Florida, Paulson was raised there and later in New York City following her parents' divorce. She began her acting career after high school in New York stage productions before starring in the short-lived television series American Gothic (1995–1996) and Jack & Jill (1999–2001). She later appeared in comedy films such as What Women Want (2000) and Down with Love (2003), and drama films such as Path to War (2002) and The Notorious Bettie Page (2005). From 2006 to 2007, she starred as Harriet Hayes in the NBC comedy-drama series Studio 60 on the Sunset Strip, for which she received her first Golden Globe Award nomination. In 2008, Paulson starred as Ellen Dolan in the superhero noir film The Spirit. Paulson has appeared on Broadway in the plays The Glass Menagerie in 2005 and Collected Stories in 2010. She also starred in a number of independent films, and had a leading role on the ABC comedy series Cupid in 2009. She later starred in the independent drama film Martha Marcy May Marlene (2011), and received Primetime Emmy Award and Golden Globe Award nominations for her portrayal of Nicolle Wallace in the HBO film Game Change (2012). She has featured as Mary Epps in the 2013 historical drama film 12 Years a Slave, as Abby Gerhard in the 2015 romantic drama film Carol, and as Toni Bradlee in the 2017 political drama film The Post. Paulson's other films include Serenity (2005), New Year's Eve (2011), Mud (2012), Blue Jay (2016), Ocean's 8 (2018), Bird Box (2018), and Glass (2019). In 2011, Paulson began starring in the FX anthology series American Horror Story, playing different characters in each of the show's eight seasons. For her work, she been nominated for five Primetime Emmy Awards and won two Critics' Choice Television Awards for Best Supporting Actress in a Movie/Miniseries. In 2016, Paulson portrayed real life prosecutor Marcia Clark in the first season of the anthology series American Crime Story, subtitled The People v. O. J. Simpson, for which she earned critical praise and numerous accolades, including a Primetime Emmy Award and a Golden Globe Award for Outstanding Lead Actress in a Limited Series or Movie. Paulson was born on December 17, 1974, in Tampa, Florida, the daughter of Catharine Gordon (née Dolcater) and Douglas Lyle Paulson II. She spent her early life living in South Tampa until her parents' divorce when she was five years old. After her parents' separation, Paulson relocated with her mother and sister to Maine, then to New York City. Her mother worked as a waitress, and Paulson lived in Queens and Gramercy Park, before settling in Park Slope, Brooklyn. She recalled of this period: "My mom was 27 years old [when we moved]. She didn't know a single person in New York City. She got a job at Sardi's Restaurant... She was so brave to be basically a debutante in Tampa, Florida, having a cotillion and a coming out ball—and she picked up and brought her two kids to the greatest city in the world, not knowing anyone. My mom's kind of my hero that way." Throughout her childhood, Paulson spent her summers in Florida staying with her father, who was an executive at a Tampa door manufacturing company. She attended P.S. 29 in Brooklyn before attending Manhattan's Fiorello H. LaGuardia High School and the American Academy of Dramatic Arts. Paulson began working as an actress right out of high school. She appeared in the Horton Foote play Talking Pictures at the Signature Theatre, and in an episode of Law & Order in 1994. The next year Paulson appeared in the Hallmark television film Friends at Last (1995) opposite Kathleen Turner, playing the adult version of Turner's character's daughter. She also starred in the short-lived television series American Gothic (also 1995), playing the ghost of a murdered woman. Paulson at the 2006 Drama Desk Awards. In 1997, Paulson made her feature film debut in the independent thriller film Levitation, playing a woman who discovers she is pregnant after an anonymous sexual encounter. Leonard Klady of Variety noted that Paulson and her co-stars are "not supported by the script," concluding: "Levitation is a grim, convoluted saga of identity and belonging. An ill-fitting combination of melodrama and magic realism, the indie effort will have a decidedly difficult time in the theatrical arena." She also appeared Off-Broadway in a fall 1998 production of Killer Joe. She subsequently played Elisa Cronkite in The WB comedy-drama series Jack & Jill (1999). The same year, she was also cast opposite Juliette Lewis and Diane Keaton in the drama The Other Sister, playing the lesbian sister of a developmentally-disabled woman in San Francisco, and in a supporting part playing a hostage in the comedy Held Up, opposite Jamie Foxx. The following year, she had a small supporting role in the comedy What Women Want, starring Mel Gibson and Helen Hunt. Paulson had a minor recurring role in the HBO series Deadwood (2005–2006), and was a focal character in an episode of the FX series Nip/Tuck. She starred as the main character in the NBC series Leap of Faith. She was then cast in the period comedy Down with Love (2003) in a central role, portraying the friend and editor of a writer (portrayed by Renee Zellweger). In 2004, she had a supporting role in the ABC series The D.A., which ended after only four episodes. In the spring of 2005, Paulson starred in a revival of The Glass Menagerie on Broadway, opposite future American Horror Story co-star Jessica Lange. Ben Brantley of The New York Times deemed the production as "misdirected and miscast... Reality never makes an appearance in this surreally blurred production." Later that year, Paulson appeared Off-Broadway in a production of Colder Than Here, opposite Lily Rabe (also her future co-star on American Horror Story). The production received an unfavorable review from Variety, with critic Dave Rooney writing: "Rabe speaks in an affected monotone while Sarah Paulson has the measured, upward-inflected delivery of a children’s TV presenter... this mannered, melancholy play elicits a mainly impassive response, which is no small obstruction in a work dealing with loss." Also in 2005, Paulson had a small role in the Joss Whedon-directed science fiction film Serenity. In the 2006–07 television season, Paulson co-starred in NBC's Studio 60 on the Sunset Strip, playing Harriet Hayes, one of the stars of the show-within-a-show. This role earned her a nomination for Golden Globe Award for Best Supporting Actress – Series, Miniseries or Television Film. In December 2008, Paulson appeared in the screen adaptation of Will Eisner's comic book The Spirit, playing an updated version of the character Ellen Dolan. Paulson on the red carpet at the 2011 Toronto International Film Festival. In 2008, ABC cast Paulson in the pilot Cupid, which was ordered to series. It was a remake of the 1998 series starring Jeremy Piven and Paula Marshall. In the new version, Paulson starred opposite Bobby Cannavale. It debuted in late March 2009 on ABC but was cancelled on May 19, 2009, after six episodes. In February 2010, Paulson was cast as the circa 1982 mother of main character Meredith Grey, on the ABC drama Grey's Anatomy, appearing in a flashback sequence in a season six-episode. She then played Nicolle Wallace in the HBO film Game Change (2012), based on events of the 2008 U.S. presidential election campaign. For her performance, she earned Primetime Emmy Award and Golden Globe Award nominations. In the spring of 2010, she starred in Donald Margulies's Collected Stories alongside Linda Lavin on Broadway. The same year, Paulson filmed the independent drama Martha Marcy May Marlene, in which she starred opposite Elizabeth Olsen and Hugh Dancy, portraying the wealthy sister of a woman who has escaped a cult. The film was released in the fall of 2011. 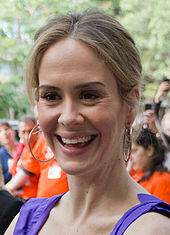 Simultaneously, Paulson guest-starred in three episodes of the FX anthology series American Horror Story, playing medium Billie Dean Howard. Paulson returned the following year for season two, American Horror Story: Asylum, in which she played a new character, Lana Winters, a writer who is committed to an asylum for being a lesbian. During this time, she also played the supporting role of Mary Lee in the acclaimed 2012 drama film Mud, starring Matthew McConaughey. Paulson returned to theater in March 2013, appearing in an Off-Broadway production of Talley's Folly opposite Danny Burstein. She then starred in the third season of American Horror Story, titled Coven (2013) as Cordelia Foxx, a witch who runs an academy for other young witches. The same year, she starred as Mary Epps, an abusive slave-owner, in the historical drama film 12 Years a Slave. The film was a critical success, earning numerous accolades. In 2014, Paulson appeared in the fourth season of series of American Horror Story, titled Freak Show, playing the roles of conjoined twin sisters Bette and Dot Tattler, who are members of a circus freak show. She returned for the fifth season, subtitled Hotel, in the role of Hypodermic Sally, the ghost of a drug addict trapped in a Hollywood hotel. She also reprised the character of Billie Dean Howard in the last episode of the season, making a crossover appearance. During this time, Paulson also took on the role of Abby Gerhard in the Todd Haynes-directed romantic drama Carol (2015), a period piece in which she played the supporting role of Cate Blanchett's close friend. Beginning in February 2016, Paulson starred in the first season of the true crime anthology series American Crime Story, The People v. O.J. Simpson, portraying prosecutor Marcia Clark. She received widespread praise for her performance and won various awards, including the TCA Award for Individual Achievement in Drama, a Primetime Emmy Award for Outstanding Lead Actress in a Limited Series or Movie, and a Golden Globe Award for Best Actress – Miniseries or Television Film. In June 2016, the Human Rights Campaign released a video in tribute to the victims of the 2016 Orlando nightclub shooting; in the video, Paulson and others told the stories of the people killed there. In the fall of 2016, she starred sixth iteration of American Horror Story, subtitled Roanoke; in it, she was cast in the dual roles of British actress Audrey Tindall and tortured wife and yoga instructor Shelby Miller, the latter of whom is portrayed by Tindall's character in My Roanoke Nightmare, a documentary within the series. She also reprised her role of Lana Winters in the final episode of Roanoke, in which the character makes a crossover appearance. After completing Roanoke, Paulson appeared in the series' seventh season, Cult (2017), in which she played restaurant owner Ally Mayfair-Richards,  as well as Susan Atkins in the 10th episode of the season. She also starred as Geraldine Page in one episode of the first season of drama anthology series Feud (2017), which chronicles the turbulent working relationship between actresses Bette Davis and Joan Crawford. Paulson was subsequently cast as part of an all-female ensemble in the heist film Ocean's 8 (2018), co-starring with Cate Blanchett, Sandra Bullock, Anne Hathaway, Mindy Kaling, Awkwafina, and Rihanna. The film was a commercial success, grossing nearly $300 million at the worldwide box office. Paulson returned for the eighth season of American Horror Story, titled Apocalypse, which premiered on September 12, 2018. In Apocalypse, Paulson reprised both the Murder House and Coven roles of Billie Dean Howard and Cordelia Foxx, respectively, and also starred as the sadistic Miss Wilhemina Venable. In addition to appearing as three characters, Paulson also directed one of the season's episodes, marking her directorial debut. She played Sandra Bullock's character's sister, Jessica, in the drama horror film Bird Box, which was released on Netflix in December 2018. In 2019, Paulson starred as Dr. Ellie Staple in the superhero thriller film Glass. She will next be seen in the drama film The Goldfinch and the horror thriller film Run. In January 2019, it was announced that Paulson will star as Nurse Ratched in the upcoming Netflix drama series Ratched. Paulson was diagnosed with melanoma on her back when she was 25. The growth was later removed before the cancer could spread. Paulson was in a relationship with actress Cherry Jones from 2004 to 2009. Addressing her sexuality in a 2013 interview with Broadway.com, Paulson said "the situation is fluid for me." Before her relationship with Jones, she had only dated men, including then-fiancé playwright Tracy Letts. She would later comment: "If my life choices had to be predicated based on what was expected of me from a community on either side, that's going to make me feel really straitjacketed, and I don't want to feel that." Since early 2015, Paulson has been in a relationship with actress Holland Taylor. Paulson lives in Los Angeles. ↑ Blanchett, cate. "Sarah Paulson". Time. New York City: Meredith Corporation. Retrieved September 11, 2017. 1 2 "Sarah Paulson Biography". TV Guide. Retrieved September 9, 2018. ↑ UPI Staff (December 17, 2017). "Famous birthdays for Dec. 17: Bill Pullman, Sarah Paulson". United Press International. Retrieved August 30, 2018. ↑ "Full text of "Record of the Hampden-Sydney Alumni Association"". Hampden-Sydney College of Virginia. Retrieved August 30, 2018 – via Internet Archive. 1 2 3 Persaud, Babita (March 28, 2002). "A big leap from Tampa". St. Petersburg Times. Retrieved February 6, 2014. 1 2 3 "Swimmers - Cast - Sarah Paulson". Theatre Fire Films. Retrieved September 9, 2018. 1 2 3 Schulman, Michael (March 2, 2016). "Sarah Paulson Opens Up About Acting, Marcia Clark and Dating Older Women". The New York Times. Retrieved September 9, 2018. ↑ "A Conversation with Actor: Sarah Paulson". Broadway World. February 4, 2013. Retrieved December 14, 2013. ↑ Yant, Monica (January 3, 1996). "'Gothic' door to stardom opens Series: CONNECTIONS". Tampa Bay Times. Retrieved January 13, 2014. ↑ McCarthy, John P. (March 30, 1995). "CBS Sunday Movie: 'Friends at Last'". Variety. Retrieved September 12, 2018. ↑ Muir 2001, p. 404. 1 2 Klady, Leonard (April 20, 1997). "Levitation". Variety. Retrieved September 11, 2018. ↑ Brantley, Ben (October 19, 1998). "THEATER REVIEW; Dysfunctional, to Say the Least". The New York Times. Retrieved August 20, 2018. ↑ "Sarah Paulson – Movies and Biography". Yahoo! Movies. Retrieved January 17, 2014. ↑ Schwarzbaum, Lisa (March 5, 1999). "The Other Sister". Entertainment Weekly. Retrieved September 10, 2018. ↑ Feeney, Mary K. (May 12, 2000). "'Held Up' Doesn't Add Up". Hartford Courant. Retrieved July 29, 2018. ↑ McCarthy, Todd (December 10, 2000). "What Women Want". Variety. Retrieved September 10, 2018. ↑ Bianculli, David (March 4, 2005). "There's No Deadwood in this Cast". New York Daily News. Retrieved September 10, 2018. ↑ Phipps, Keith (May 13, 2003). "Down With Love". The A.V. Club. Retrieved September 12, 2018. ↑ Erickson 2010, pp. 74–75. 1 2 Brantley, Ben (March 23, 2005). "A 'Menagerie' Full of Stars, Silhouettes and Weird Sounds". The New York Times. Retrieved September 10, 2018. 1 2 Rooney, Dave (September 28, 2005). "Colder Than Here". Variety. Retrieved September 10, 2018. ↑ MTV Staff (September 16, 2013). "One 'Serenity' Actor is Looking for Another Gig with Joss Whedon". MTV. Retrieved August 30, 2018. ↑ Dyer, James (September 2007). "Sarah Paulson Full Of The Spirit". Empire. Retrieved December 19, 2017. ↑ Bierly, Mandy (March 31, 2009). "'Cupid' stars Bobby Cannavale and Sarah Paulson take the EW Pop Culture Personality Test". Entertainment Weekly. Retrieved September 12, 2018. ↑ Kimball, Trevor (May 19, 2009). "Cupid canceled". TV Series Finale. Retrieved September 8, 2018. ↑ Ausiello, Michael (January 20, 2010). "Exclusive: 'Grey's Anatomy' recasts Richard and Ellis!". Entertainment Weekly. New York City: Meredith Corporation. Retrieved January 13, 2014. ↑ Boucher, Ashley (April 26, 2018). "'Grey's Anatomy': Elizabeth Moss, Sarah Paulson and 9 More Stars You Forgot Appeared on the Show". San Francisco Chronicle. Retrieved September 9, 2018 – via SFGate. ↑ Isherwood, Charles (April 28, 2010). "A Literary Life Can Turn Lonely When the Cheering Stops". The New York Times. Retrieved September 12, 2018. 1 2 Lane, Anthony (October 24, 2011). "Family Farm". The New Yorker. Retrieved September 9, 2018. ↑ Gennis, Sadie (December 9, 2015). "American Horror Story's Sarah Paulson Reprising Murder House Role in Hotel Finale". TV Guide. Retrieved September 9, 2018. ↑ Goldberg, Lesley (June 11, 2013). "Emmys: Sarah Paulson on the Tortures of Being on 'American Horror Story'". The Hollywood Reporter. Retrieved September 9, 2018. ↑ Debruge, Peter (May 28, 2012). "Mud". Variety. Retrieved September 8, 2018. ↑ Markovitz, Adam (March 7, 2013). "Talley's Folly". Entertainment Weekly. Retrieved September 9, 2018. ↑ Ayers, Mike (October 16, 2013). "Sarah Paulson: 'American Horror Story' Is Too Scary for Me". Rolling Stone. ↑ Rocchi, James (December 12, 2013). "Sarah Paulson channels many nasty emotions for '12 Years a Slave'". Los Angeles Times. Retrieved September 9, 2018. ↑ Collin, Robbie (June 3, 2016). "12 Years A Slave, review: 'This, at last, really is history written with lightning'". The Telegraph. London. Retrieved September 9, 2018. ↑ Goldberg, Lesley (October 8, 2014). "'American Horror Story's' Ryan Murphy Explains How Sarah Paulson Plays Conjoined Twins". The Hollywood Reporter. Retrieved September 9, 2018. ↑ Birnbaum, Debra (October 14, 2015). "'American Horror Story's' Sarah Paulson on That Fall, Lady Gaga and Sally's True Addiction". Variety. Retrieved December 2, 2015. ↑ Archer, Stephanie (July 25, 2018). "Sarah Paulson Clarifies Dual Characters in American Horror Story: Apocalypse". Screen Rant. Retrieved September 9, 2018. ↑ Truitt, Brian (November 20, 2015). "Review: 'Carol' is an acting masterclass". USA Today. Retrieved August 30, 2018. ↑ Goldberg, Lesley (December 9, 2014). "Cuba Gooding Jr., Sarah Paulson to Star in FX's 'American Crime Story: People v. O.J. Simpson'". The Hollywood Reporter. Retrieved January 12, 2015. ↑ Yee, Lawrence (January 8, 2017). "Sarah Paulson Wins Golden Globe for Best Actress in a Limited Series or TV Movie for 'The People v. O.J. Simpson'". Variety. Retrieved September 9, 2018. ↑ "49 Celebrities Honor 49 Victims of Orlando Tragedy". Human Rights Campaign. Retrieved June 30, 2016. ↑ Gennis, Sadie (September 26, 2016). "The True Star of American Horror Story: Roanoke Is Sarah Paulson's Hair". TV Guide. Retrieved September 9, 2018. ↑ Birnbaum, Debra (October 31, 2016). "'American Horror Story' Crossover: 'Asylum's' Lana Winters to Appear on 'Roanoke'". Variety. Retrieved September 9, 2018. ↑ Hayman, Amanda (July 24, 2017). "American Horror Story: Cult Artwork Reveals Season 7 'Love Story'". Screen Rant. Retrieved August 1, 2017. ↑ Petski, Denise (August 23, 2016). "Sarah Paulson Will Play Geraldine Page In Ryan Murphy's Feud For FX". Deadline.com. Retrieved February 28, 2017. ↑ Snierson, Dan. "Sarah Paulson joins Ryan Murphy's Feud". Entertainment Weekly. Retrieved September 14, 2016. ↑ Stolworthy, Jacob (June 6, 2018). "Ocean's 8: What the critics are saying about all-female reboot". The Independent. Retrieved June 6, 2018. ↑ "Ocean's 8 (2018)". Box Office Mojo. Retrieved September 10, 2018. 1 2 Turchiano, Danielle (August 3, 2018). "Sarah Paulson and Evan Peters to Direct 'American Horror Story: Apocalypse'". Variety. Retrieved September 12, 2018. ↑ Denise Petski (January 14, 2019). "'Ratched': Sharon Stone, Cynthia Nixon Among 10 Cast In Ryan Murphy's Netflix Series". Deadline. Retrieved January 20, 2019. ↑ Allen, Jane E. (June 25, 2002). "Skin Cancer Cases On The Rise Among Teens, Young Adults". Orlando Sentinel. Orlando, Florida: Tronc. Retrieved September 10, 2018. ↑ "Cherry Jones, Sarah Paulson Split". Us Weekly. Retrieved October 9, 2009. ↑ "Talley's Folly Star Sarah Paulson on Not Starring in Annie, Not Playing Kristin Chenoweth and Not 'Boffing' Jessica Lange". broadwayworld.com. Key Brand Entertainment. March 22, 2013. Retrieved January 13, 2014. ↑ Wilkins, Vanessa (March 2, 2016). "Taylor and Paulson in relationship since early 2015". abcnews.go.com. Retrieved September 10, 2018. ↑ Griffith, Carson (April 27, 2017). "Sarah Paulson Was Shocked To Find This Buried In The Yard Of Her New House". Architectural Digest. Retrieved September 9, 2018. Erickson, Hal (2010). Encyclopedia of Television Law Shows: Factual and Fictional Series About Judges, Lawyers and the Courtroom, 1948–2008. Jefferson, North Carolina: McFarland. ISBN 978-0-786-45452-5. Muir, John Kenneth (2001). Terror Television: American Series, 1970-1999. Jefferson, North Carolina: McFarland. ISBN 978-0-786-40890-0.